These conditions can usually be distinguished on the basis of the patient's symptoms, clinical history, and the radiographic appearance of the lesion. Ductal cysts, choledochal cysts, and Caroli disease are differentiated from hepatic cysts by involvement of the bile ducts and are not reviewed in this article. The cause of simple liver cysts is not known, but they are believed to be congenital in origin. 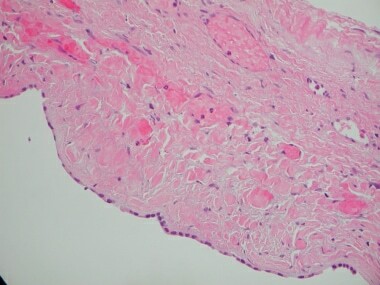 The cysts are lined by biliary-type epithelium (see the image below), and perhaps result from progressive dilatation of biliary microhamartomas. Because these cysts seldom contain bile, the current hypothesis is that the microhamartomas fail to develop normal connections with the biliary tree. Typically, the fluid within the cyst has an electrolyte composition that mimics plasma. Bile, amylase, and white blood cells are absent. The cyst fluid is continually secreted by the epithelial lining of the cyst. For this reason, needle aspiration of simple cysts is not curative, and recurrence is the norm. Histology demonstrating biliary epithelium lining simple cyst. In patients with PKD, the kidney cysts usually precede the liver cysts. PKD often results in renal failure, whereas liver cysts only rarely are associated with hepatic fibrosis and liver failure. Liver tumors with central necrosis visualized on imaging studies are often misdiagnosed as liver cysts. True intrahepatic neoplastic cysts are rare. The cause of cystadenomas and cystadenocarcinomas is unknown, but they may represent proliferation of abnormal embryonic analogs of the gallbladder or biliary epithelium. These cystic tumors are lined with biliary-type cuboidal or columnar cells and are surrounded by ovarianlike stroma. Cystadenoma is a premalignant lesion with neoplastic transformation to cystadenocarcinoma confirmed by tubulopapillary architecture and invasion of the basement membrane. In a retrospective study, Kim et al investigated the value of quantitative color mapping of the liver’s arterial enhancement fraction (AEF) in the detection of hepatocellular carcinoma (HCC). The investigators determined that when the color maps were analyzed in combination with multiphasic computed tomography (CT) scans, the mean sensitivity for HCC detection reached 88.8%, in comparison with 71.7% sensitivity for HCC detection using the multiphasic CT scans alone. Hydatid cysts are caused by infestation with the parasite Echinococcus granulosus. This parasite is found worldwide, but it is particularly common in areas of sheep and cattle farming. The adult tapeworm lives in the digestive tract of carnivores, such as dogs or wolves. Eggs are released into the stool and are inadvertently ingested by the intermediate hosts, such as sheep, cattle, or humans. The egg larvae invade the bowel wall and mesenteric vessels of the intermediate host, allowing circulation to the liver. Hepatic abscesses can be amebic or bacterial in origin. Entamoeba histolytica is the causative agent in amebic abscesses. It is contracted by ingestion of food or water contaminated by the cyst stage of the parasite. Amebiasis generally only involves the intestine but can invade the mesenteric venules resulting in liver abscesses. Its only host is the human. Pyogenic abscesses can be a result of instrumentation but are most often caused by ascending cholangitis in the setting of biliary obstruction. Microorganisms isolated are most often bowel flora. Other routes of contamination include the portal vein and hepatic artery. Patients with intra-abdominal infections may present with liver abscesses with extension of bacteria through the portal venous system. Hematogenous spread via the hepatic artery in patients with septicemia is rare. The precise prevalence and incidence of liver cysts are not known, because most do not cause symptoms; however, liver cysts have been estimated to occur in 5% of the population. No more than 10-15% of these patients have symptoms that bring the cyst to clinical attention. Hepatic cysts are usually found as an incidental finding on imaging or at the time of laparotomy. Most series in the literature are relatively small, reporting fewer than 50 patients each. Patients with PCLD have lower cure rates (see Table 1 below). Investigating optimal treatments for nonparasitic hepatic cysts, Mazza et al analyzed the outcomes associated with various surgical procedures used to treat these lesions. The study involved the evaluation of data from 131 patients (78 with simple cysts, 53 with PCLD) treated at an institution where the authors practiced. Mazza et al reported that laparoscopic unroofing or marsupialization (66 patients) completely relieved symptoms from either simple lesions or PCLD, with the procedure's morbidity, mortality, and recurrence rates being, respectively, 2%, 0%, and 2% for patients with simple cysts, and 25%, 0%, and 5% for patients with PCLD. For infected cysts, the investigators' procedure of choice was percutaneous drainage (19 patients), the morbidity, mortality, and recurrence rates for this procedure being, for simple cysts, 0%, 0%, and 75%, respectively, and for PCLD, 0%, 0%, and 20%, respectively. Damiani MF, Carratù P, Tatò I, Vizzino H, Florio C, Resta O. Recurrent pulmonary embolism due to echinococcosis secondary to hepatic surgery for hydatid cysts. J Comput Assist Tomogr. 2012 Sep. 36(5):534-5. [Medline]. Onori P, Franchitto A, Mancinelli R, et al. Polycystic liver diseases. Dig Liver Dis. 2010 Apr. 42(4):261-271. [Medline]. Kim KW, Lee JM, Klotz E, et al. Quantitative CT color mapping of the arterial enhancement fraction of the liver to detect hepatocellular carcinoma. Radiology. 2009 Feb. 250(2):425-34. [Medline]. Djuricic SM, Grebeldinger S, Kafka DI, Djan I, Vukadin M, Vasiljevic ZV. Cystic echinococcosis in children - the seventeen-year experience of two large medical centers in Serbia. Parasitol Int. 2010 Jun. 59 (2):257-61. [Medline]. Ernest E, Nonga HE, Kynsieri N, Cleaveland S. A retrospective survey of human hydatidosis based on hospital records during the period 1990-2003 in Ngorongoro, Tanzania. Zoonoses Public Health. 2010 Dec. 57 (7-8):e124-9. [Medline]. Kneuertz PJ, Marsh JW, de Jong MC, Covert K, Hyder O, Hirose K, et al. Improvements in quality of life after surgery for benign hepatic tumors: Results from a dual center analysis. Surgery. 2012 Aug. 152(2):193-201. [Medline]. Morino M, De Giuli M, Festa V, Garrone C. Laparoscopic management of symptomatic nonparasitic cysts of the liver. Indications and results. Ann Surg. 1994 Feb. 219(2):157-64. [Medline]. Hansen P, Bhoyrul S, Legha P, et al. Laparoscopic treatment of liver cysts. J Gastrointest Surg. 1997 Jan. 1(1):53-47. Fabiani P, Mazza D, Toouli J, Bartels AM, Gugenheim J, Mouiel J. Laparoscopic fenestration of symptomatic non-parasitic cysts of the liver. Br J Surg. 1997 Mar. 84(3):321-2. [Medline]. Martin IJ, McKinley AJ, Currie EJ, Holmes P, Garden OJ. Tailoring the management of nonparasitic liver cysts. Ann Surg. 1998 Aug. 228(2):167-72. [Medline]. Katkhouda N, Hurwitz M, Gugenheim J, Mavor E, Mason RJ, Waldrep DJ, et al. Laparoscopic management of benign solid and cystic lesions of the liver. Ann Surg. 1999 Apr. 229(4):460-6. [Medline]. Zacherl J, Scheuba C, Imhof M, Jakesz R, Függer R. Long-term results after laparoscopic unroofing of solitary symptomatic congenital liver cysts. Surg Endosc. 2000 Jan. 14(1):59-62. [Medline]. Fiamingo P, Tedeschi U, Veroux M, Cillo U, Brolese A, Da Rold A, et al. Laparoscopic treatment of simple hepatic cysts and polycystic liver disease. Surg Endosc. 2003 Apr. 17(4):623-6. [Medline]. Robinson TN, Stiegmann GV, Everson GT. Laparoscopic palliation of polycystic liver disease. Surg Endosc. 2005 Jan. 19(1):130-2. [Medline]. Konstadoulakis MM, Gomatos IP, Albanopoulos K, Alexakis N, Leandros E. Laparoscopic fenestration for the treatment of patients with severe adult polycystic liver disease. Am J Surg. 2005 Jan. 189(1):71-5. [Medline]. Fabiani P, Iannelli A, Chevallier P, Benchimol D, Bourgeon A, Gugenheim J. Long-term outcome after laparoscopic fenestration of symptomatic simple cysts of the liver. Br J Surg. 2005 May. 92(5):596-7. [Medline]. Mazza OM, Fernandez DL, Pekolj J, et al. Management of nonparasitic hepatic cysts. J Am Coll Surg. 2009 Dec. 209(6):733-9. [Medline]. PAIR: puncture, aspiration, injection, re-aspiration. World Health Organization. Available at http://apps.who.int/iris/bitstream/10665/67207/1/WHO_CDS_CSR_APH_2001.6.pdf. 2001; Accessed: June 12, 2018. Amendolara M, Bucca D, Barbarino C, Romano MF, Marino G, Zucchelli M, et al. Surgical management of symptomatic simple hepatic cysts. G Chir. 2012 Jan-Feb. 33(1-2):17-20. [Medline]. Gall TM, Oniscu GC, Madhavan K, et al. Surgical management and longterm follow-up of non-parasitic hepatic cysts. HPB (Oxford). 2009. 11(3):235-41. [Medline]. [Full Text]. Schnelldorfer T, Torres VE, Zakaria S, et al. Polycystic liver disease: a critical appraisal of hepatic resection, cyst fenestration, and liver transplantation. Ann Surg. 2009 Jul. 250(1):112-8. [Medline]. Akbulut S, Senol A, Sezgin A, et al. Radical vs conservative surgery for hydatid liver cysts: experience from single center. World J Gastroenterol. 2010 Feb 28. 16(8):953-9. [Medline]. [Full Text]. Yan-Hong F, Lin-Xue Q, Hai-Ma G, Qing Z, Yu G, Xiangdong H. Sclerotherapy of simple hepatic cysts by repeated aspiration and alcohol instillation. Turk J Gastroenterol. 2012 Aug. 23(4):359-65. [Medline]. Delis SG, Bakoyiannis A, Karakaxas D, et al. Hepatic parenchyma resection using stapling devices: peri-operative and long-term outcome. HPB (Oxford). 2009. 11(1):38-44. [Medline]. [Full Text]. Ultrasonographic appearance of large simple hepatic cyst. Computed tomography (CT) scan appearance of large hepatic cyst. Computed tomography (CT) scan of polycystic liver disease curiously limited to right liver. Hepatic cysts. Sagittal magnetic resonance imaging (MRI) reconstruction in patient with large echinococcal cyst; note daughter cysts in interior. Computed tomography (CT) appearance of biliary cystadenoma. Resection of involved liver in polycystic liver disease. Laparoscopic view of initial hepatic cyst puncture, before unroofing. Lesion is located high in right liver near the diaphragm. Laparoscopic view of beginning of unroofing of large simple hepatic cyst near dome of right liver. Drawing of final result of laparoscopic unroofing of a large simple hepatic cyst in right liver. Initial penetration of hepatic cyst with drainage of cyst fluid. Omentum sutured to excised margin.